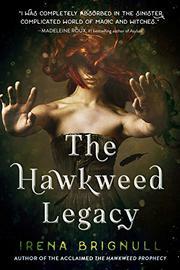 Witch queen Poppy Hawkweed returns in this sequel to The Hawkweed Prophecy (2016). After the events of the last book, Poppy attempts to escape her new life as a witch queen by transforming into a swallow and migrating to Africa, though to what part of the vast continent is unclear. There, white Poppy’s taken in by a medicine maker, Mma, and her dark-skinned great-grandson, Teko. Though Mma and Teko are initially portrayed as likable characters, they eventually imprison Poppy, ostensibly for her own good, as they’ve seen a vision that she will be killed if she returns to England. Back in England, the third-person narrative perspective shifts among characters and times. There’s Poppy’s birth mother, Charlock, both in the present and when she was younger, as well as Leo, Ember, and Betony, Leo’s mother. Through the many lenses and back stories readers learn of Leo’s conception and what became of Betony, who left the witches to have her son. Teko eventually allows Poppy to escape, and once back in England, she’s bullied into taking up her queendom. But there are many twists and turns and painful betrayals to be hashed out before there’s a chance of happily ever after. Though themes of sisterhood are strong, most female relationships are interrupted, if not broken, by male intrusion. The real unbreakable bond in these stories is that between mother and child.